Thank you for visiting farvoyager.com! Please feel free to add your comments to this guestbook. In the interest of privacy, your comments will not appear immediately; they will be added to the official guestbook once a week after they have been reviewed for appropriateness. Please note that your email address will not be displayed in the guestbook, nor will it be used for any purpose other than communication regarding this website. Hi, many thanks for the wonderful site filled with information and wonderful descriptions. I've lived 6 months in Reunion Island (west of Mauritius) so I've heard a lot about these islands you've visited. Just wish someday I'll be able to visit all of them just like you did. Again thanks for sharing it with us. I came across your site while researching Saint Paul's island for a game I want to make. What a wonderful trip it must have been. Thanks for sharing. Super stuff! My heart is warmed you were able to fulfill your dream and what a dream it was too! Thanks, Francis, for posting this tour for all of us to see. "Better late than never" for myself, as it appears that you experienced this adventure about 12-years ago. Your internet tour helps me to imagine what it would be like to live on such remote islands! Thank you! I really enjoyed reading about your trip. I came across your site while researching Amsterdam Island. Thanks for sharing your experience! Later, after a few mouse clicks, I began your journey and could feel my insides melt away with a kind of relaxation I haven't felt in ages. Just to experience where there isn't another living soul and connect with it for awhile sounds wonderful, and I got a chance to..kind of..do so. Thanks. I should be working but I spent an enjoyable time viewing your adventures. Thank you for creating this. Aloha - Fantastic job documenting the trip! I've been on a trip with Heritage expeditions (Commonwealth Bay and the islands in between) and thought about this trip! Seemed like you had a spectacular time. I'm Jealous! What a great site! Like you, I've always been fascinated by maps and was curious about the antipode of the SF Bay Area, and starting surfing tonight. I don't know if you ever met David St. Charles, but I worked for him prior to Wind River, so that was quite a small-world coincidence. Thanks for the fantastic pictures and description. I would love to visit St Paul Island one day, which is how I found your website. The pictures only entice me more. I've been reading Apsley Cherry-Gerard's "The Worst Journey in the World." I am always curious what places mentioned in my reading look like. Googling ile saint-paul, antarctic, I came across your website. Once I had seen what you have on St. Paul Island, I was drawn into your journey, and spent the next hour and a half 'traveling' your photographs. What a wonderfully helpful resource you have created! It's unlikely I will go on such a journey, yet I feel as though I have, now that I've spent time seeing it through your camera lenses. And please tell your wife that as a quilter, too, I think her quilt creation is fantastic--beautifully done. Thank you so much. Fascinating. I am very interested in Ile Saint Paul. May I use your aerial(?) photo of the island? I am writing a very local history book about Ipswich Qld. One parish priest in a 450 tonner was forced to call in there in 1846. What a great site! Stumbled on it one quiet Sunday evening searching for info on Amsterdam island. Thanks for sharing your trip. BTW...have you seen a book titled 'Atlas of Remote Islands' by Judith Schalansky...beautiful and fascinating read for those interested in such remote places (where I first read about Amsterdam island). Thank you for sharing this exciting trip!! I enjoyed reading it and seeing the pictures. These islands were hitherto unknown to me; now I want to learn more! A wonderful trip report from some most unusual destinations! Makes me want to do a similar trip myself one day. In 1964 on a trip from Cape Town to Melbourne our ship passed between Saint Paul and Amsterdam Islands and ever since then they have held a fascination for me. Your narative makes me feel as if I was present in Chicago at your presentation--Thanks. A great read, Francis. The only island I had read about was Kerguelen island. It was shown on British TV after jornalist Matthew Paris spent 2 months there in 2000. Thanks for sharing your journey with us! What a wonderful thing to be able to travel to the place in the world that has held your fascination since childhood. I have only recently learned of these islands, and it's fun to daydream about a visit to them. Came across this site while checking out Amsterdam Isl. My husband yesterday flew out over this area in the search for young USA sailor Abby Sunderland - they found her and hopefully she will be picked up today. I don't know what the rescue plans are for her, but there is a possibility of her going to Amsterdam Island, so I was just checking out what she will see if she does. Ended up enjoying your voyage very much. Cheers, Toni in West Australia. I am just reading a shortly issued book "Atlas der abgelegenen Inseln" which tells stories about 50 of the most faraway islands of the world. The pages about St.Paul-Island brought me to your impressive photos and stories about a wonderful voyage. Thank you for giving others the possibility to take part. I am fascinated with Amsterdam Island and appreciate your photos and narrative very much. I would like to go there, but it looks as though one has to be a member of a scientific team and go on an arranged tour. I would be happy to do this as a tour, but don't know how to find out about one. Thanks again. its all about the clouds. in the end. i suppose. thank you so much for the joyful last hours. i hope you are planning your next trip already and let us all join again - the wikipedia link was an excellent idea. Thank you for taking the time to create this website. Always been fascinated by isolated places and for an American the only land masses that qualify as antipodes of the continental US is about as isolated as it gets. Thanks for sharing. Great story and pictures. I too am fascinated with islands- especially remote ones and have been spending some time on the internet researching the islands in the southern ocean. My dream still, at 65, is to sail leisurely around the world stopping at all the interesting and out of the way places. That was an excellent array of pictures and information. I too stumbled upon your site after finding these islands on google earth. You've inspired me to document my travels like this as well! I find your pictures really stunning and this is why I'm writing. For almost 30 years now I have been working on a world wide postal project called ?Inviting the World at Home?. In this project I have been trying to receive an identical postcard from every territory in the world surrounded by international borders or issuing it?s own stamps (so not only independent countries but also exclaves, colonies, overseas territories, remote islands and more). Up to now I have received over 400 of these cards, sent from as many different countries and territories in the world, thus forming an almost complete inventory of all the world?s postal links to the Netherlands. I am now making a 450 page book on this project which will feature one received card, and thus one territory, per page. Apart from the received card, and some text, each page will feature illustrations depicting local postal activities and scenery. I have, through the years, been able to collect many postal photographs from many places in the world most of them taken by myself or by friends and acquaintances. For some territories I have found pictures on the internet. One of them is your beautiful pic on Kerguelen seen from the sea and I would like to ask your permission to use this picture in my book. Your name will of course be mentioned as the photographer right on the page itself. Hopefully you are willing to cooperate by giving me permission to use your photograph. Please let me know if you have any questions, or look at my website www.weijburg.nl , (click on ?Inviting the World? in the menu bar and then on ?English? to see an English translation) for more info on my postal project. Well done on living your childhood aspiration! A bonus you could be in such company having such breadth & depth (esp. those associated with HIMI). I enjoyed your piccies. I am presently focussing on HIMI in a research project for the University of Tasmania's School of Geography & Environmental Studies (Centre for Spatial Information Science). What a perfectly sweet web offering. Thank you very much for the effort and the education! What a fabulous trip, Francis! Your photos are wonderful and I love Mary Jo's penguin exhibit and gorgeous quilt! Definitely a worthwhile voyage. I have been a long time " Google earth " explorer and came across these tiny islands very recently! On further google search I bumped into your site!! Great website through an almost totally unknown-to-me part of the world. Got here because I collect postal history of TAAF,knew of Kerguelen from this but wanted to find out about St Paul & Amsterdam. My travels are within the US, have crossed 50+ times,IL a favorite, do you know Funk's Grove? Troy Grove? Glad you made your lifelong dream, your website shows the internet at its best use ! Being bored and tired of work I searched the www for remote places to go...or to send my Boss to ;-)...I found your very interesting Website about this unique trip! Thank you for sharing your experience and making it possible to take part in a voyage I will most likely never do! Thank you for sharing your absolutely amazing (and well documented) journey. Wow. Thanks for doing this journal. This is precisely the journey I wish to take one day. Thank you. ...in case you need to know where you'll wind up when you dig straight down. Anyway, using this map I discovered that the only land opposite the continental US is a few specks located in ... the southern Indian Ocean! Which led to Google, which led to this very informative and enjoyable diary of your adventure. Thanks for putting so much effort into your site. Great pictures of a super remote part of the world. Fascinating exploration, I'm sure! Thanks for sharing it. A fascinating web site. The videos are amazing! Thank you. Thanks for the site and photos! It is great to finally find some information on this fascinating (but difficult to research) part of the world. Found this site using Google Earth. I spent a very pleasant hour or so viewing the photos and reading your comments. Thank you so much for posting this online. I envy you Francis, to have been travelling along those wonderful remote places on our southern hemisphere...! I've been travelling myself to many places on this globe, some remote, some less remote (please have a look at my website, sorry texts are in Dutch, but pictures are not). Thanks very much for sharing your adventurous memories...! Hi francis. I came across your site from the wikipedia article on Ile Amsterdam. I bought my 3yr old son a globe recently, as he is learning about the continents at preschool. He pointed to a dot in the south atlantic called "Bouvet" so I looked it up. Having always been interested in remote places, I kept following a chain of articles on islands to the east while he wandered away. Your great site much appreciated and it must have been the trip of a lifetime. Great quilt too! Thanks for sharing this wonderful adventure, I enjoyed it very much, hope I will be able to go some day. Very informative and well-written site. It really does sound like the trip of a lifetime. Thanks for sharing it. Fascinating, I am really envious. What a great trip to places most people don't even know of, let alone visit! Thanks for a wonderful travel story. I happened on your site after googling 'Amsterdam Island' as I plan to sail Capetown-Sydney and ports of call are rare. Fascinating!!! I'm sure you consider yourself very lucky - thanks for sharing this! I came across your web site while searching for St. Paul island. Great work. Read all the writings and watched the videos. It is very good of you to share your journey with us. Thanks for this great story and the pictures, in particular for the detailed map snippets. I always enjoy reading experiences from trips to the lonely parts of our planet, especially to remote islands. Very nice trip log. Thanks for sharing it. What a lovely respite from the office! Found this site yesterday through Wikipedia and proceeded to spend the entire day reading about your journey. Thank you so much for putting this page up! Enjoyed reading your travelogue! Did any of the islands you visited have big waves/surf breaking on the shore? Truly wonderful travelogue of what must have been a great trip. Pictures and comments were excellent. Thank you for sharing a trip of a lifetime. A lovely virtual slide night. Thanks for the opportunity to return to the islands from your point of view. I stumbled across your site while browsing through Wikipedia looking for information on the Kerguelen Islands. Great pictures, video, and commentary. Thanks for putting this site up! I was looking for pictures of the french TAAS as I study geography in Nantes ( France ) and I found your website ! Awesome, I'm so glad you created this page to share with the world. Spent the past hour reading your site and thoroughly enjoyed it. You've added a nice website which puts a different perspective on visiting these islands. Another visitor who came here after looking for my city's antipodal point and finding Ile Saint Paul. Thanks for a great site! Yet another link via wikipedia. This site is simply amazing, i read every single page. Keep up the good work! Another linked via Wikipedia. Great site, thanks for all the information, maps and pictures. A great example of the web bringing some of the most remote parts of the world to our living rooms. I was interested to learn that French governed islands (Amsterdam and Saint Paul) are closer to Australia than the Australian governed island (Heard). All the best, Rob. I found your fantastic site via Wikipedia, when I was once again looking at the islands on the opposite of the world to where I live wich I like you noticed on my large world map. I read your description on how these places interested you and it was funny how similar it was to mine. More seem to have gone through similar according to the above comments. Many of the pictures you have taken could just as well have been taken here in Iceland, and that is one of the things that interest me in these places, that they could be considered mirror islands of Iceland. I am going to have fun showing my family and friends some of the pictures and make them guess where they are taken. fantastic site-- was reading up on the french colonial empire and discovered your site (linked from wikipedia, of all places). really top notch photos, good historical and geographical descriptions. a pleasure. I was perusing through Google Earth, wondering what was directly on the opposite side of the world from me. Then while googline "ile saint-paul" I came across this website. Wow Francis, you documented exactly what I was hoping to see. 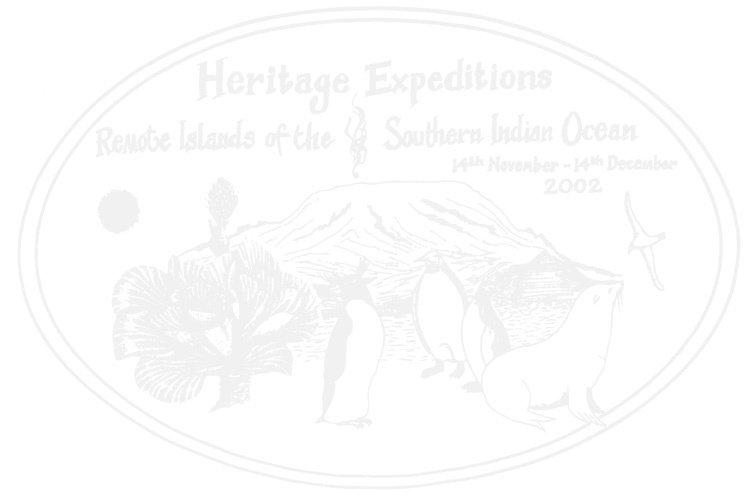 Now I am making plans with Heritage Expeditions to see it myself. I especially loved the penguins. Keep this site up! Great site ! Since 10 years I am extremely interested in Atolls and the most tiny specks of land in the world (Oceans) I am a (also virtual) Celestial navigator, and travel the whole (virtual) globe from one to the other island and use the net to inform me over the beautiful world we have to respect. When is the next expedition ?! I,ll be your man. Since I was teenager I became really curious and interested in that little islands in the south hemisphere that are not always displayed into the Atlas. Thanks to the web I started to find informations and, for the first time, also some pictures. Last year I read the book ?L?arche des Kerguelen? by Jean-Paul Kauffmann and I literally fell in love to this archipelago. Now I?ve found your web-site: it?s wonderful!!! You made the trip of my dreams. Thanks to share with us your exciting experience. I really enjoyed visiting your website. I am especially interested in the South Atlantic islands of Ascension, St. Helena and Tristan da Cunha; so it was interesting for me to see how your photos of these southern islands compared. Great site and beautiful pictures. Thanks for putting it up. Any plans for another expedition? My mom gave me your Website. She got it from you at The Reunion. This is a great site. Your trip sounds fabulous! Loved the photos, etc. Francis, what a site! I just revisited it (again) and thought I'd better finally sign your guestbook if I'm going to keep coming back. You've done an amazing job of documenting the trip, which even today calls my mind back across the sea to those very special islands. Thank you. What a wonderful website! It sounds and looks like a fascinating voyage. A nice perk from your employer; it must be a good company to work for. I am just a college student, but I became interested in the S. Indian Ocean Islands after putting up a large world map next to my bed in my dorm room. I woke up one morning and saw Amsterdam Island, located in the middle of nowhere, and I immediately became fascinated. You have a great website here, and I only hope that one day I could go on an expedition like this! Thanks so much for putting this site together (I am telling all my friends). It's wonderful to see these places again, and through your eyes, not my own. We all pick up such different aspects of the same experiences. Do you have a photo of the total eclipse -- it was yet another great moment on that trip for us all. This is such a joy to view! The photographs are so professional and the written details are so very interesting. Thank you for taking the time to create and share this e-documentary. You have done an excellent job, capturing the voyage. It is something I am often thinking about especially as the first anniversary is upon us. My friends are very complimentary on the web site design and flow. Well done, Francis!! You have elegantly and comprehensively captured the highlights of our month-long journey across the far reaches of the Southern Ocean. Now it is possible for anyone with a web browser to enjoy our discoveries for considerably less time and expense! They will only miss the numerous and enjoyable Scrabble sessions which we so enjoyed. Thank you for doing this! At long last, I have completed most of what I wanted to do with this site. There will, of course, be lots of polishing in the days ahead, and no doubt an addition or two, but it is essentially complete. Please leave your comments (and let me know of any broken links or other problems). Happy voyaging!